Whomp whomp. There're no Baseball Catcher Smurves for sale. Baseball Catcher Smurf crouches down behind home plate ready to catch the pitcher's ball, wearing a face mask, vest, knee pads, and a thick padded glove. 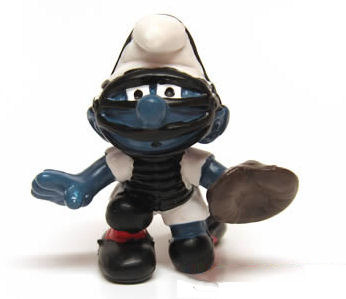 It is a Baseball Catcher Smurf. It is a small figure that fits with the smurf figures. It doesn't do anything but sit there and look cool.